A great value! Save time and money with this generous assortment of our most popular types and grits of Straight Cartridge Rolls, in Coarse, Medium and Fine grades. Keep these Cartridge Rolls in your shop for a variety of hard-to-reach applications. Essential tools for engine porting, including intake manifold, heads and exhaust manifold. 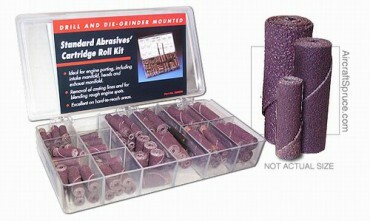 Kit includes 1/4", 3/8" and 1/2" cartridge rolls, in 40 and 80 grit, and mandrels.